The Tank Guy Manawatu was called in to solve some issues at a rural property in Pohangina Valley, Manawatu. The property that had a competitors’ aging plastic tanks that were poorly manufactured and starting to fail after approximately 15 years. 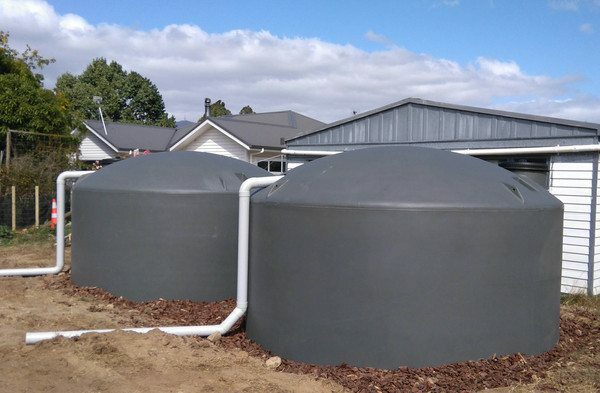 The existing tanks were installed poorly and were too high, producing flooding issues around the house during high rain periods as the overflow was not considered at the time of installation. Leaf debris and pollen were also proving to be an issue for the home owners effecting the quality of their drinking water. Other issue unique to the area was the amount of aerial spraying where spray drift could land on the roof and be flushed in to the tanks at the next rain event which led to less than ideal drinking water. The Tank Guy removed the existing tanks and partially buried two Polyethylene Devan 25,000L tanks into the ground to remove the height and flooding issues the property owners were experiencing by reducing the overall height of the tanks and plumbing the overflow away to a more suitable discharge point. Purrain filters were installed to take care of the pollen and leaf debris issues along with manual diversion facilities put in place to stop rain from entering the tanks after aerial spraying. To increase the amount of catchment the garage is now connected to the rainwater tanks. The resulting system ensures the home owners have plenty of rainwater available to get through the dry summers as well as having a catchment area larger enough to forgo the rainwater after aerial spray events. The home owners now can have confidence in their new rain water tanks with Devan’s 20 year Warranty.